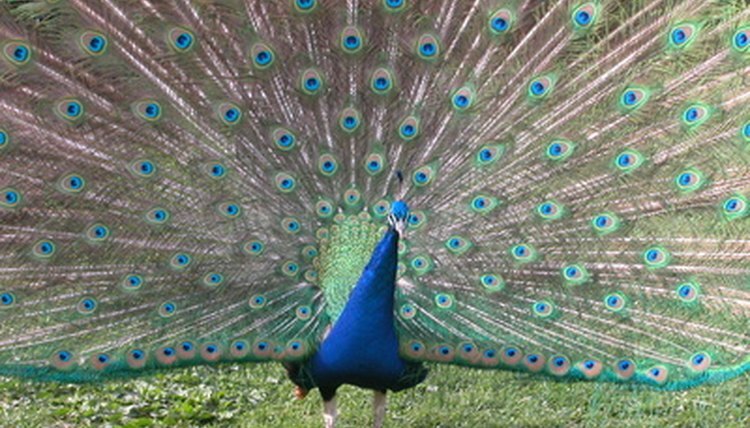 Peafowl, often called peacocks after the more colorful male of the species, are a favorite among many bird lovers because of their colorful plumage and distinctive calls. But in states such as Florida, where the large birds run wild in many areas, peafowl have their share of both fans and detractors. While tourists and some locals find peafowl fascinating, others believe they're a nuisance. Laws about peafowl in Florida can be vague with regard to removal or relocation. Blue peafowl, the most common type of the bird and the one which is most commonly seen roaming Florida neighborhoods, are not considered wildlife. Rather they are classified by state law as domestic livestock, the same classification that applies, for example, to chickens. According to the Florida Fish and Wildlife Conservation Commission, that means the state has no authority to regulate the birds. Instead, the task of making and enforcing laws about peafowl is up to individual communities. Each community may have its own rules regarding what a resident is permitted to do to remove or eliminate nuisance peafowl from the area. However, peafowl may find some protection under Florida's state animal cruelty laws. Peafowl fans and animal lovers of all types can rest assured that, in most cases, the exotic birds are safe from physical harm at the hands of unhappy neighbors. Florida state law prohibits the use of poison to kill animals without a permit. In some counties, residents may shoot peafowl that roam onto their property, but this measure is forbidden in areas such as Sunny Lawn Estates, an unincorporated area near St. Petersburg where dozens of peafowl wander. An ordinance in Miami-Dade County states that property owners may remove peafowl from their own land as long as they do not physically harm the birds. It is also illegal to hunt or kill peafowl in that part of Florida, as well as to harm the birds' eggs or nests. And in Longboat Key, near Sarasota, an ordinance adopted in 1969 forbids purposely harming or killing a peafowl. Laws about peafowl in most parts of Florida do not prohibit capture or trapping. But property owners who take this measure in the hopes of releasing the peafowl in a more desirable location should beware: Releasing the large birds into the wild is a crime. Another problem with trapping peafowl is that animal control won't be much help. In communities that are especially overrun with peacocks and peahens, many animal control organizations don't have the manpower or equipment to handle such a task. The good news for Florida property owners who want to reduce or eliminate the peafowl populations in their areas is that the birds can be released, as long as they are transferred to a location that is not in the wild, such as an animal sanctuary or the property or farmland of a willing owner.